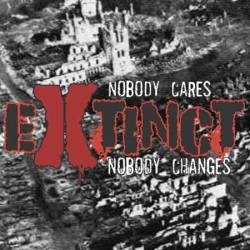 If you believe everything you read on the Winged Skull homepage, then Extinct would be like one of the best street punk bands of all time. With all due respect to the people behind that excellent organisation (without whom the local punk scene would only be half what it is now), I think there is a lack of objectivity as Extinct vocalist Dario also plays guitar with Last Millennium Suckers, where also his brother and label founder Giordano plays bass guitar. I first heard Extinct on the Tales From The Winged Skull compilation where they were one of the weaker bands. Now, a year later, they recorded their first full length CD Nobody Cares, Nobody Changes at the home recording studio of Charles from the Holy National Victims. The first problem would then be the sound quality: all in all it is quite alright, but the bass frequencies could be more dominating, especially the bass guitar is not prominent enough, and the drums sounds a bit washed down. The music itself is very good, especially the two guitars are played above amateur league. The vocals are another point of criticism: as much as I love well done punk snottiness (Rancid still are the champs when it comes to that), Dario's vocals are not articulated enough, something you really notice when you sit down with the lyrics sheet. It would also be a sign of professionalism to have the lyrics looked over by somebody with better English knowledge (grammar and pronunciation are sub par unfortunately). Not all is bad, of course, but compared to other punk bands, this is at the very most only a mediocre album by a band with a certain potential, but still a long way ahead. 5 points with the suggestion that you might want to go and see Extinct live and if you like them, you should support them by buying their album.